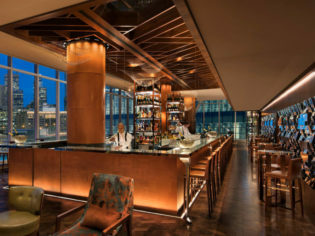 The Champagne Bar - spectacular perch from which to admire the CBD. A beacon of change for Darling Harbour? Lara Picone scales the heights of Sofitel’s grand new harbour-city property, Sofitel Sydney Darling Harbour. It’s difficult to pinpoint exactly when Darling Harbour started to look a little weary. But once the Millennium ticked over and we were suddenly beyond 2000, and it became clear the monorail wasn’t the transport system of the future (or even the present day), it all began to feel a bit like a school project diorama. Sure, it seems awesome at the time, but years later, when you pull it out from the back of the closet, it just looks a little embarrassing and naive. Once the monorail was dismantled and bought by a Taiwanese businessman who ‘felt sorry for it’, Darling Harbour’s future seemed even more uncertain. Then Barangaroo sprung up, and all that glittered was across the water. The Harbourside Shopping Centre, a rabbit warren of mass-produced souvenir tat for confused tourists and a hangout spot for teens trapped between aquarium excursions and legal drinking age, seemed to cower beneath the threat of a wrecking ball… and still does (and should). It looked dire for that side of the harbour, despite the new International Convention Centre. 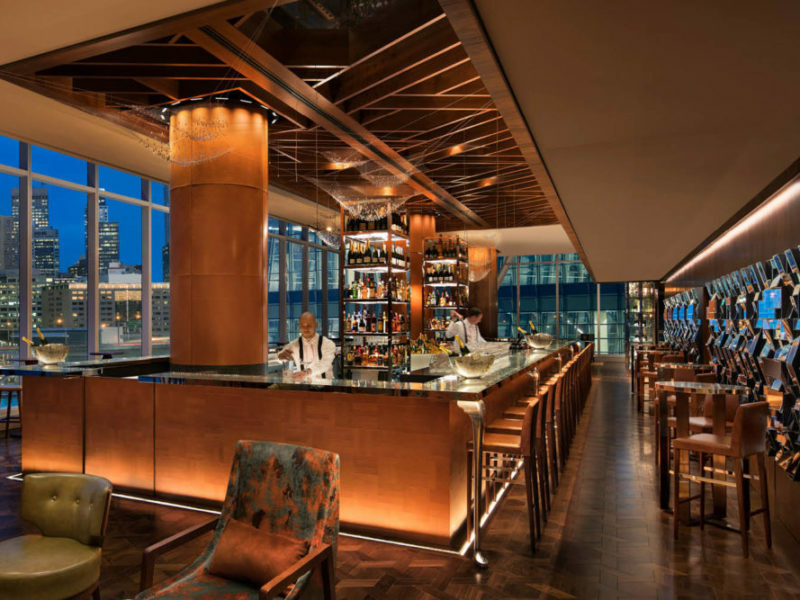 Enter Sofitel Sydney Darling Harbour, the hotel group’s first brand-new build in Australia. While we’re on milestones, it’s also the first new build, five-star, internationally branded hotel to be built in Sydney since the Olympics! Shiny and tall with a deep-V on its city-facing chest, it’s vaguely reminiscent of Superman. While it’s no architectural marvel, the building and, more specifically, the hotel, may well save Darling Harbour from the sticky grasp of mediocrity. But can a hotel have sway on its location? Is it the beacon of change it appears to be from across the water? The first thing I notice in the yawning, bright but inviting foyer is the perfume. Is that a signature scent? If it is, I want it for my home. Check-in is smooth enough and I’m shown to the elevators; each with warm wooden tones and individual artwork, they feel like mini moving foyers. My superior room comes with unobstructed views of mingling conference attendees on a balcony of the ICC. Thanks to the glass walls of the centre, I’m also treated to surveying the routines of the cleaners. But I can also see out across the ICC roof to southern Sydney. Not every room can come with jaw-dropping views and these lower-end ones aren’t made for languishing around during the day. However, when my husband arrives, we attempt some languishing, because at $359 a night, one wants to derive some enjoyment from the sleek interior styling. We hit a roadblock when the wi-fi and mirroring don’t work. We call down to room service to ask if there’s any way we can play music, but we’re told that if we want to listen to music, we’ll have to bring our own speakers from home. Not something one generally packs. We call again to try for a booking in the restaurant, but are told it’s full until 9.30pm. That’s fair enough; we did leave it a bit late. Music-and-booking-less, we abscond to the Champagne Bar, passing by a definitively half-empty restaurant. Maybe the front desk weren’t aware there were so many tables in the restaurant? We decide to try again after a glass of Champers. The view from the bar is stunning, especially as dusk slips into evening and the CBD lights up. Even as a Sydneysider, it doesn’t get old, and we linger over another drink just to savour the grandeur. It’s definitely a spot for bringing interstate or international guests. Service is delightfully French-accented, if a little confused and ambivalent, but we put this down to teething problems. We attempt the still half-empty restaurant again. After a five-minute wait without a soul coming to tend to our needs, we decide we can do without a $50 main and settle for a less-than-lacklustre meal in the wilds of Darling Harbour. It’s a missed opportunity that the Sofitel hasn’t opened a more casual, public-facing eatery for those who can’t dine upstairs at Atelier, considering the dearth of good eats on offer. The next morning we make the most of the sensible 11am check-out and head to the pool. With views of the city, an infinity edge pool, bar and ample sun lounges, this sunny, wind-protected spot is nothing short of heaven. Alongside the Champagne Bar, it’s a pretty persuasive reason to re-book. Despite a few teething issues, the Sofitel is quite lovely. Without deviating too much from the mould of a large, branded hotel, it manages to give a sense of being a little more bespoke. Sydney did need another hotel of this exacting calibre, especially over this side of town, but will it solve Darling Harbour’s woes? Not alone. The Sofitel may be handicapped by its surroundings for now, but it’s the start of a reinvigoration and a good building block for better calibre development this side of the city. It’s just a shame a wrecking ball didn’t accidentally take out the Harbourside mall during the build. Sofitel Sydney Darling Harbour, 12 Darling Drive, Sydney, NSW. Verdict: It won’t solve the Darling Harbour dilemma, but it’s a good start. We rated: The pool. It will be one of Sydney’s hidden treasures. We’d change: For a hotel of this standard, the service was pretty blunt. It also needs a spa. Notes: We paid $359 for a superior room. Breakfast not included.